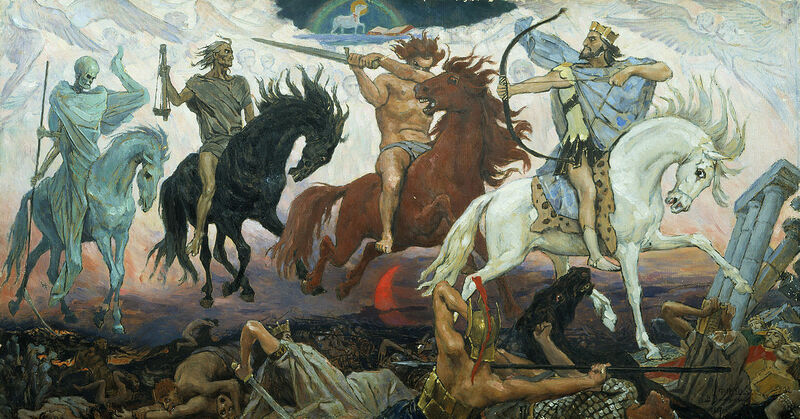 There are more than four horsemen. We could consider what happens after we leave the EU in March 2019. We will probably have to renegotiate some sort of trading relationship, possibly under WTA rules with absent or minimalist tariffs. Would this be acceptable to the EU27 who will somehow have to plug the fiscal deficit the UK will leave behind? Life will go on after Brexit in a way most of us cannot envisage at this time. 'The vessel with the pestle or the chalice from the palace'. The usual quality dissection of the problem Effie. I have the notion that the harsh reality of world economics will catch up with the EU in short order though. Spain, Italy and Greece now almost basket cases, will bring down the prison walls. Hopefully we will have made our escape by then. Othering and rubbishing the EU and its members may be a salve for your own fears but its not going to help the UK one bit. The EU has according to many been dying since the day it was put together. The Euro is a dead project, yet here we are in 2018, 16 years after it entered circulation. Its >20% stronger against the GBP than it was at inception. What does that tell us about the GBP ? How do you escape in the modern world from your envisaged economic meltdown of some of your biggest markets ? This thinking shows no logic over schoolboy whataboutery and even the possibility in itself is on shaky ground. If it breaches this 1.05 level then who knows where the bottom is as there is no technical support below there. The magnetic draw of parity to the Euro must also be creating headwinds. This is even with a .25% rate increase....Who'd be Carney now. Politically impotent on Brexit and having to try and save the currency. It must be like watching a train crash in slow motion and knowing you cannot do anything about it. The United Kingdom is probably the most successful political union in history, it is also of a manageable size. We just do not need to be in the EU...whose avowed policy of 'ever closer union' can have only one destination...a single European state it's former nations relegated to administrations. Pretty sure its past its sell by date given its been staggering from one disaster to another since end of the war. WW2 was also only a blip at the end. Truth is that the Empire has been dying on its arse since the start of the 20th century. Maybe the flukey Falklands and a win on the back of Russia/US in WW2 being the highlights and winning world cup at home in 1966. Lets airbrush the genocide before the 20th century in multiple continents. Looks great if you have red,white and blue specs on for sure. Must be comfortable sitting in England and saying its been great. While to use your phrase, "the other countries are relegated into administrations" within the UK. Not much self awareness going on there. Today the challenge is of course this magnificent jump to the right by what looks like just about everyone outside of Liverpool. Turning yourselves into what will end up a prison state that you cannot leave and that does not get enough food delivered. It'll be like East Germany and the wall will be the channel and the North sea. Prison state? What bollox RM. We'll be able to trade with the parts of the world that are actually growing and not sinking into the mire of complacency, social degradation and 'yooman rites' culture. The future lies with places like China, India and Brazil. Europe is old, tired and fat. As to your first point, Scotland chooses to be in the UK - the UK never ever signed up for political union with Europe. We agreed to a common market that then morphed out of all recognition into something very different. Ted Heath should be posthumously hung, drawn and quartered, for treason. Free trade can be usefull for a country but anyone with half-a brain (ie this excludes the vast majority of TOries and UKIp supporters) knows that capitalism per se has NO INHERENT LOYALTY to ANY country in this world so free trade SHOULD NOT be turned into an absolute fetish as these people are apt to do. Let's fashion a form of capitalism that works for OUR NATION and makes it a SERVANT of the nation NOT its master just like the nationalist Japs have been able to do otherwise Brexit will be a very hollow experience for the vast majority of ordinary Britons and lead to yet more de-industrialistion etc with the consequent growth of an 'underclasss'. Surely, we've had enough of that under radical market liberal Mrs Thatcher and the globalist Bliar? BTW the WTO is not democratically elected but I'm sure it will be fine. What a difference a few weeks makes in the scheme of things. Italy now seems to have seen through the Establishment values of Brussels and is now belligerent and indifferent to the charms of integration. They have joined the Poles and others who now want some closure on open border diktats from the schemers in Berlin and Paris. Most likely the sceptical and gritty Brits will get the blame for all the perceived European disasters for the foreseeable, but what could we have done? More importantly what could Dave Cameron have done differently during his final attempt at making European bon viveurs see sense? We will have fudge for Christmas, or if not then, by D-Day. Effie, there is no point in leaving the EU when continual mass immigration is turning this country into a foreign land and thus rendering the point of the British people having their own independent nation state null and voild. After all, what is the purpose of striving for your own nation state or to reclaim an effective one from Brussels if your nation disappears from history? The BNP is NOT 'racist'. That is just a ridiculous smear put about by hard-leftists and globalist TORY and their spare wheel party of morons called UKIP who view Britain as being purely a business park and not a real country. Continual mass immigration is also a weapon used by the EU to break-down and ultimately destroy national identities and thus weaken any real form of nationalism within the states of the EU so that the people of these countries don't mind having over more and more powers to Brussels. That is the reality and parties on the Continent understand this ie the German Alternative Fur Deutschland (AFD) and Marine Le Pen's Rassemblemant National (RN-National Rally) but it takes someone with a coherent political philsophy to understand this and that excludes Tory and UKIP globalists. It is no acciden that the most immigrant-infested part of Britain voted Remain in such high numbers. ie London voted Remain by a high percentage and within that the only boroughs that didn't were the outermost ones with relatively few immigrants and a fairly strong representation of native Britons. The real victims of what is defined as racism in Britain are the indigenous population. After all, Labour, Lib Dem (as can be expected) and increasingly the liberal-left globalist RADICAL MARKET LIBERAL Tories say we British don't even exist!